There are a number of traditional braces techniques that can help you reposition your teeth in a comfortable, discreet manner. 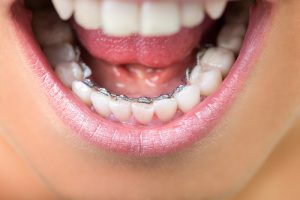 Traditional braces often come in both metal and clear varieties, and are composed of brackets and wires that work to move the teeth into a straighter position. 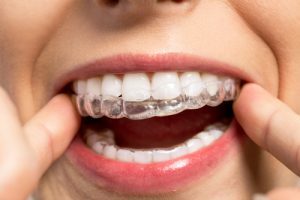 Although traditional orthodontic techniques can sometimes be overshadowed by new methods such as Invisalign® and other innovations, metal and clear braces have improved significantly over the years and can serve as excellent alternatives for patients who may not be candidates for other orthodontic treatments. Please contact Dr. Chris Murphy at Murphy Orthodontics to schedule a consultation for braces treatment. Our board-certified orthodontist can give you a full orthodontic evaluation and discuss all of your options. Thank you so much for getting my teeth straight! Not only has it changed my teeth but my jaw and whole face as well! I’m glad to have the braces off, and I’ll be smiling a LOT more now! Traditional metal braces can be helpful to bring misaligned teeth into a more desirable position. Metal braces are able to provide gradual, continuous pressure to these teeth in order to bring them into better alignment. A bracket is placed on each tooth and an arched wire is attached to help make this kind of movement possible. Wires are often held in place with small rubber bands, which are available in many different colors. The length of this treatment will vary on each patient’s needs. Dr. Murphy will create a treatment plan that can help meet your desired outcome. Traditional braces techniques are not like they were in the past. Dr. Chris Murphy can come up with an orthodontic treatment plan for you that utilizes traditional braces in the most comfortable and cosmetically pleasing way possible. Dental insurance can often cover part of the cost but will vary from plan to plan. Therefore, it is best to check with your insurance provider to determine what your out of pocket expense may be. We work with orthodontic financing companies that offer a range of flexible payment options for qualified applicants. We also accept cash, check, Visa®, MasterCard®, American Express®, and Discover® credit cards. At Murphy Orthodontics, we believe that you should have access to a healthy and beautiful smile, so we will work with you to find the best payment solution. What Other Types of Braces Are Available? Damon braces use a self-ligating technique and do not require brackets or elastic ties to move teeth into a straighter position. This helps create the feeling of a more relaxed treatment. Damon braces also use shape-memory wires to shorten treatment time by moving the teeth into position faster. Clear brackets are available with this system, which allow for a more aesthetically pleasing smile during your treatment. Learn more about Damon Braces. Invisalign clear teeth aligners can be more comfortable than traditional braces, as there are no metal parts. This orthodontic system is nearly invisible and the aligners can be removed at your convenience, such as when you eat, drink, or brush your teeth. Each clear aligner is customized to address your orthodontic needs by gradually straightening your teeth and improving your bite alignment over time. In-Ovation R braces are a unique orthodontic treatment specifically designed to align crooked teeth in a more hygienic way than other methods. These braces require less follow-up appointments to our office as they use a self-ligation process. In-Ovation R braces do not require the use of elastic bands, and therefore can be easier to keep clean. For patients interested in clear brackets, Dr. Murphy also offers In-Ovation C, which is less visible than traditional metal braces. Learn more about In-Ovation Braces. Lingual braces work similarly to traditional metal braces in that they use brackets and wires. The biggest difference between these two orthodontic treatment methods is that other people cannot see lingual braces at work. The braces are designed to go on the back of your teeth and bring them into a straighter position in the same or less time than traditional braces. They are also made with flexible wiring to help make the process comfortable and efficient. Learn more about lingual braces.